Summary: Paneer is a homemade Indian cheese. Paneer is used many different ways making desserts, appetizers and main course dishes. Mix lemon juice in half cup of hot water and put aside. Boil the milk in a heavy bottomed pan over medium heat, stirring occasionally, making sure not to burn milk. As the milk comes to a boil, add the lemon juice gradually and stir the milk gently. The curd will start separating from the whey, turn off the heat. Once the milk fat has separated from the whey, drain the whey using a strainer line with cheesecloth, or muslin cloth. Wrap the curds in a muslin cloth, rinse under cold water, and squeeze well. This process takes out the sourness from the lemon. To take out the excess water, press the wrapped paneer under a heavy pan for about 1 hour. The most important part of making paneer for dessert is how much water to take out from the paneer. To check if right amount of water is out of the paneer, take a little piece of paneer on your palm and rub with your fingers. After rubbing the paneer for about 15-20 seconds, you should be able to make a firm but smooth ball. For making sweets, paneer can be refrigerated for 1 to 2 days. Paneer from half-gallon milk will make about 15 to 20 rasgullas. I suggest 2% milk for rasgullas, rasmalai, chamcham or any other dish in that category. For sandaish, burfee or any other such dish use regular milk. Before Pressing the paneer knead it enough so paneer is not crumbly. Press the paneer instead one hour, two hours making firmer. Cut the paneer to desired shape. 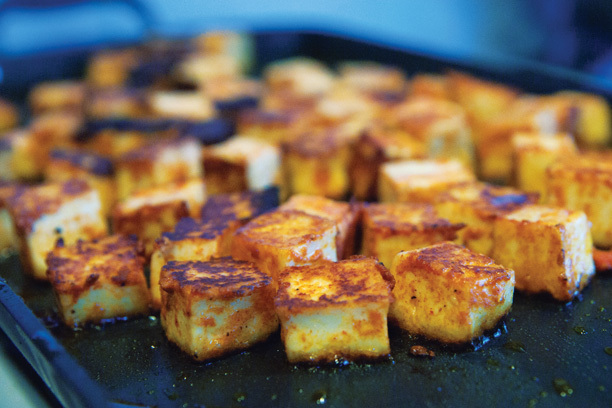 Paneer can be refrigerated for a few days or kept frozen for months. Add salt to the paneer, if you like with your choice of spices one or more, including black pepper, roasted cumin seed, chopped green chilies, chopped cilantro (Hara Dhania) or to your taste.